All summer I’ve been champing at the bit to get started on this autumn’s modules (Medieval Lit, 17th Century Lit, and Writing Journalism) but reading the module outlines has suddenly made it all very real. Laid out carefully before you is all the knowledge they expect you to accumulate and all the assessments that you will need to pass by Christmas, and knowing that these grades are going to count towards your overall degree it suddenly feels a lot more daunting. Over the summer I have deliberately avoided reading anything that I didn’t enjoy. It didn’t matter if it was high-brow or trashy, the only requirement was that I enjoyed it. I wanted to spend my summer reading things without constantly checking the page number, without worrying about finishing it before a deadline – in short, I wanted a summer of not reading like a literature student. I love studying English, but it does have a way of taking over your reading habits. After a long day of studying books it’s hard to get excited by the prospect of spending all your leisure time doing the same. This leads to the list of Netflix shows you’ve been meaning to watch growing shorter, but the stack of books you want to read growing ever higher. I miss the days when I would whip through two books in a week and not think anything of it, when books gripped me late into the night because they were exciting not because there was an essay due next week. So this summer I have truly indulged. I’ve found a new favourite author in Mary Renault (who incidentally turns out to have lived on the same road in London as me, although not at the same time and to be fair it is a very long road…), a historical fiction writer who was studying in Oxford when Sir Arthur Evans was making his breath taking discoveries on Crete and shipping them back to Oxford’s Ashmolean museum. 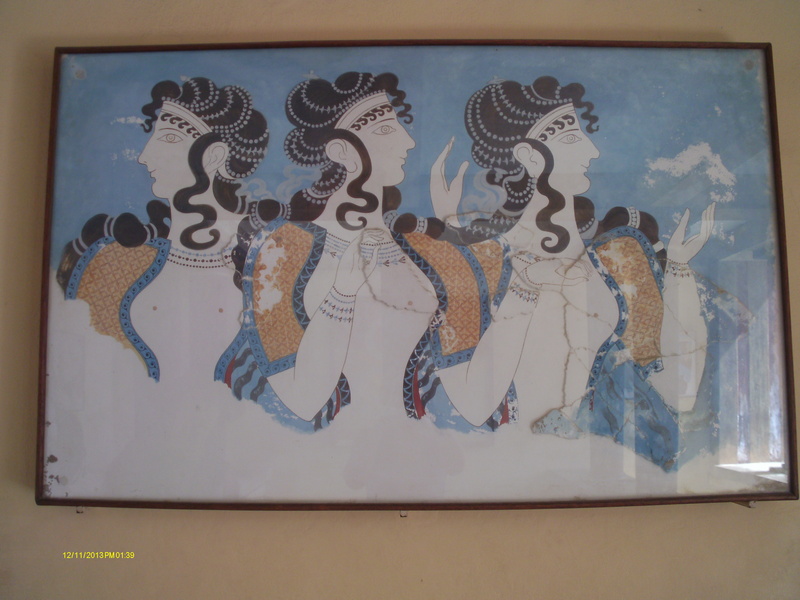 Evans discovered the remains of the palace of Knossos, a Minoan palace that is thought to have been destroyed by an earth quake over two thousand years ago. 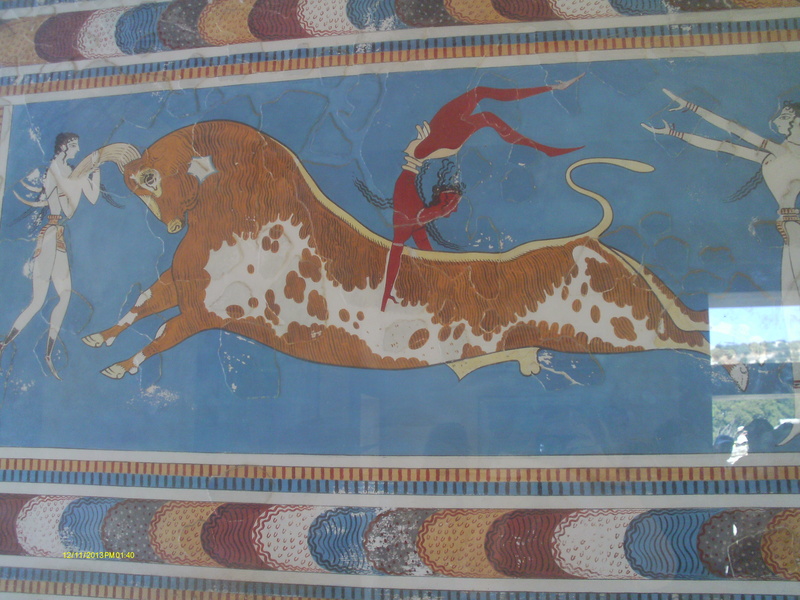 What captured Renault’s imagination however was the Minoan depictions of bull leapers, and it was these frescos she used as inspiration for her retelling of the myths of Theseus, the legendary founder of Athens and slayer of the Minotaur. After finishing my A-Levels I went to Greece for a week, specifically to Athens and Crete, the two main locations for her novels. The pleasure of reading them was heightened by the fact that I recognised the landscapes she was describing and had seen the frescos she referenced (I could write a whole heap more on literary landscapes but I shall spare you). Renault has been largely forgotten these past few years, but there is a concerted effort being made to revive this wonderful writer. Her books have been republished by Virago and many well-known writers and academics have said that her work inspired them (Bettany Hughes, Hilary Mantel, and Emma Donoghue to name a few), hopefully this attention will allow her work to go on and inspire another generation of readers. On a separate note, I read this poem by Walt Whitman for the first time recently. 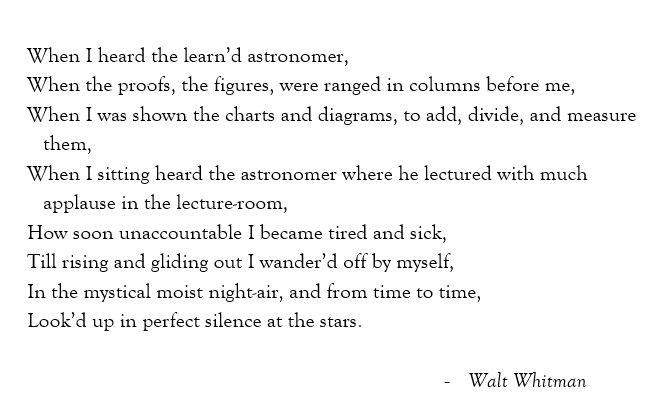 I’ve had a soft spot for Walt ever since I watched Dead Poets Society, but this poem particularly appealed to me because I think it captures something of what it is to study the subject you love. There is much we can learn from the rigorous examination of literature, but sometimes we need to wander off by ourselves, enjoy it simply for what it is, and read it in that perfect silence.